Congrats to Dr. Matthew Adamkin on being named an Insider Louisville 2019 Commitment to Compassion Award Honoree! Dr. David Haustein was recently named the new Problem-Based Learning Director for the UofL School of Medicine. Congrats, Dr. Haustein! Dr. Catherine Schuster joined staff at the children's hospital on Christmas Day 2018 for the annual visit by Louisville native - Jennifer Lawrence. Dr. Kaelin was invited to the WHAS studios in Fall 2018 to discuss brain injuries in football players. Dr. Priya Chandan was named a 2018 "Way To Go Woman" by Louisville magazine, Today's Woman! Congratulations to Dr. P. Chandan! Our Drs. Adamkin, P. Chandan, and Nelson, in conjunction with Special Olympics International, welcomed Dionte Foster from Saint Kitts and Nevis to Louisville. Dionte, who has been playing tennis on one leg since an amputation due to a diagnosis of osteosarcoma bone cancer in 2015, was fitted with a fitness prosthetic. Thanks to all who helped to make this possible! Coverage by WDRB, The Courier Journal, and UofL linked. 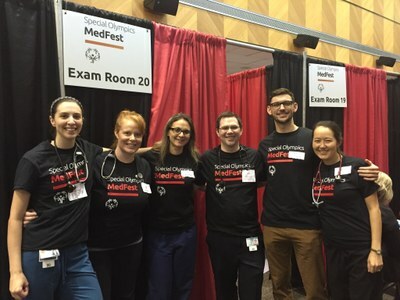 Many of our faculty and residents work with MedFest for the local Special Olympics of Kentucky providing free physicals for the athletes. Check out coverage of the 2018 MedFest! 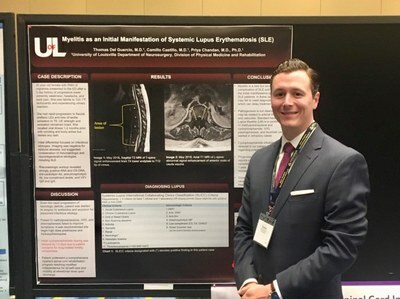 Dr. Thomas Del Guercio presented his poster, "Myelitis as an Initial Manifestation of Systemic Lupus Erythematosis (SLE)," at the 2019 AAP meeting. 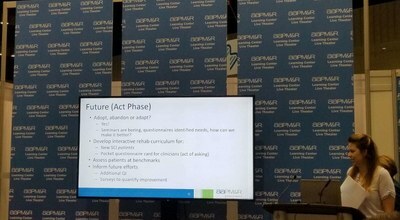 Dr. Genevieve Jacobs presented at the 2018 AAPM&R in Orlando, Florida. 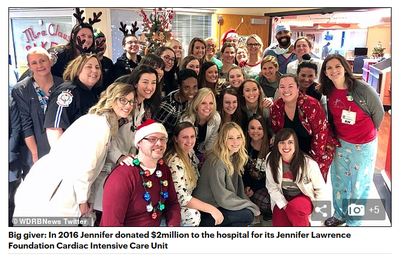 Dr. Schuster and other staff join in for a picture with Louisville native, Jennifer Lawrence on Christmas Day 2018 at the children's hospital. 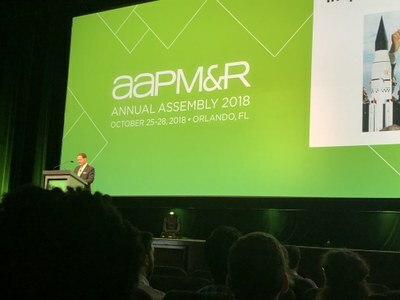 Darryl Kaelin, MD, division chief of PM&R, during his presidential address at the 2018 AAPM&R in Orlando. 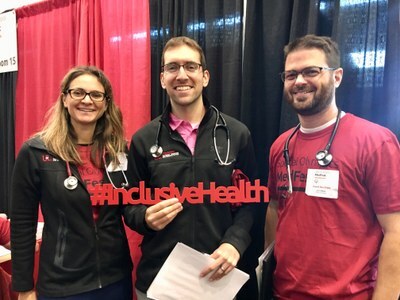 At this conference, six UofL faculty gave lectures on numerous adult and pediatric rehab topics, and our residents presented four posters, gave two oral presentations, and won the resident quiz bowl! Dr. Janakos, Dr. Adamkin, & Dr. Haustein volunteering at MedFest 2018. PM&R Residents volunteering at MedFest 2017. 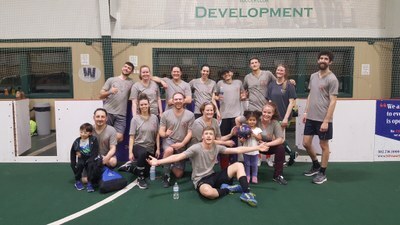 Our faculty, residents, and other team members enjoy participating in many intramural teams together.